Complete guide on choosing the right backup plugin for your site, including pros and cons. From the beginning of the internet, hackers have attempted to infiltrate websites for their own personal gain. As technology has progressed, bots have taken over the majority of the grunt work, scanning for ways to get past your login credentials to take advantage of website source databases and servers. Fortunately, the people behind WordPress have thought about these attackers quite a bit, and dozens of developers have made backup plugins to ensure that all of your website data is stored properly for a restore. Will you need a WordPress backup plugin? Hopefully not. Is it a good idea to constantly have one running in the background? Absolutely. Why? Because a website restore can be one of the more tedious and expensive parts of handling a website, and without a backup you’re bound to get stuck losing some files. So, keep reading to learn more about the top backup plugins on the market. We’ve revealed pros and cons to each and analyzed which backup plugin is best for certain webmasters. The BackupBuddy plugin provides a premium solution, with ticketed support, plugin updates and syncing. The plugin backs up your entire WordPress site, including posts, plugins, widgets and the database. It’s all consolidated into one tab in the WordPress dashboard, with options to restore, migrate, scan and schedule. The Duplicator plugin does more than just backup your site. If you’re interested in cloning, copying or transferring an entire WordPress website, this will do the trick as well. We like this one for developers who would like to bring a production site down to a local machine, since the transfer is so seamless. Th BackUpWordPress plugin is one of our favorites for beginners, because the interface is easy to use, and it completes full site backups without much complexity. It also uses a small amount of memory with its shared hosting environment. The BackWPup plugin has a reasonable price, along with a fairly powerful free version to get started with. The process is pretty simple with the scheduling of automated backups that can then get stored on other platforms. Consider using the WP-DB-Backup plugin if you’re not looking to pay any money, and you’d like a simple solution without many bells and whistles. The plugin focuses on your core database tables, but it also has the option to backup other tables in the same database. VaultPress is one of the more impressive premium options, since it uses daily and real-time syncing of your entire WordPress site to keep you at ease. The interface looks clean, with tabs for items like backups, security, stats, activity, and settings. The blogVault Real-time Backup plugin has a free plugin, but none of the features are going to be working unless you pay for a plan. Once you pay for a plan you gain access to a system with complete site backups that occur on a daily basis. The UpdraftPlus plugin is one of our favorites because it has various options for choosing where to locate your backup files. This is an incredibly popular solution, seeing as how the ratings are high and the only reason you really need to upgrade to the premium version is if you require multi-site. Check out the WP Database Backup plugin if you’d only like a database backup by using the free plugin. You can gain access to the features for a full backup if you want to pay for the pro plugin, but we would recommend another plugin with more features if you plan on paying. The myRepono plugin is a lesser known backup plugin, but we want to mention it because of the pricing structure. Basically, the developers don’t believe in charging people for resources they don’t utilize, so they have a system setup where you pay a certain amount of cents per GB used each day. For example, the lowest pricing is at $0.02 per 1 GB per day. The XCloner backup plugin has a more technical build, with backup and restore features built-in. It uses a custom script that must be implemented when you need a restore, and multiple formats and standards are used, so you have several ways to complete a backup. 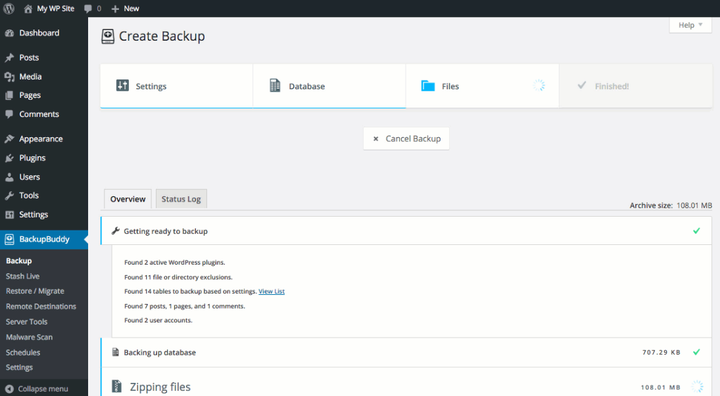 The CYAN Backup is another more complex plugin for making backups, but we like it for more experienced developers. Daily, weekly and monthly backups are offered, and each of the scheduled backups are compressed into a zip file. Which Backup Plugin is Best for You? Seeing as how you have lots of WordPress backup plugins to choose from, you still might be wondering which one is ideal for your website. Here’s our take on it: If you don’t want to pay any money (or you only want to pay a small amount of money) go with BackUpWordPress or UpdraftPlus. The premium solutions we like are UpdraftPlus, BackupBuddy, VaultPress, and Duplicator. Duplicator is by far the best if you also want migration and cloning tools, while the most user-friendly solution is UpdraftPlus. We hope this article helped you find the right backup plugin. You may also want to see our guide on best coming soon plugins and themes. If you have any questions about the best WordPress backup plugins, or if you have experience playing around with these plugins, let us know in the comments section below. When should I get a CDN for my site? Feeling like subscribing? New themes, updates and design stuff.